I like to paint anything blue and on wood. I like to paint anything blue. I like to paint anything. 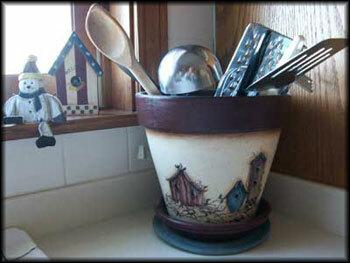 Have you ever seen a pot holding a bird house? probably not, but what the heck, it’s still cool, or at least it’s cool according to Hall. Just make your style shine. It’s scorching today in Texas and to hot to paint, so please excuse me while I go read a Blog. Til next time, have a wonderful week. This entry was posted in Painted wood crafts and tagged birdhouses, crafts, hand painted on Sunday, July 10, 2011 by Betty. I love to craft birdhouses. 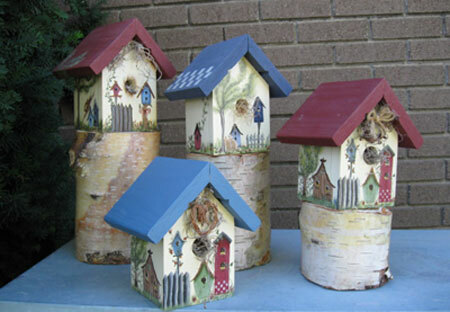 Take a piece of wood, cut out the birdhouse, use a few nails, slap on a coat of paint and you have created a birdhouse. I can’t seem to stop with one. I must have many. What do you do with many birdhouses? You sell a few. You try to get your friends to take one (your relatives already have many), and the rest are scattered around your house. We call them country home decor. These are just a few I have made over the years. I have many more in different stages of being completed. One day I will get the birdhouse fever again and finish the whole bunch. Then I will have more country home decor. Paint for fun, Paint for pleasure, Just paint! 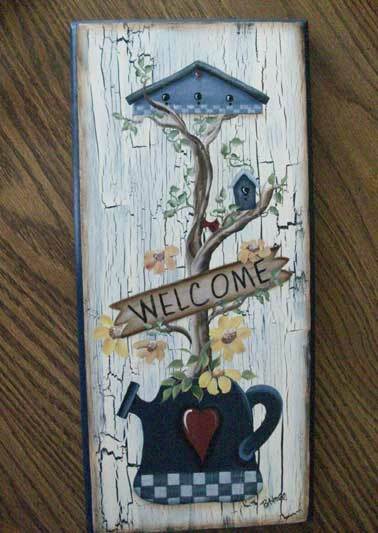 This entry was posted in Painted wood crafts and tagged birdhouses, crafts, hand painted on Thursday, April 21, 2011 by Betty. This decorative birdhouse was really a fun project. The painted birdhouses on the birdhouse were taken from the painting book “Between the Vines” by Jamie Mills-Price. I really enjoy painting her designs and have painted many of them. I made this little house out of white pine and painted it with acrylic paint. 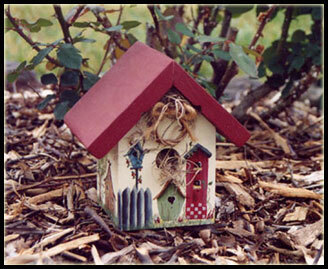 I have made lots of these small birdhouses. They make great decorating accessories. 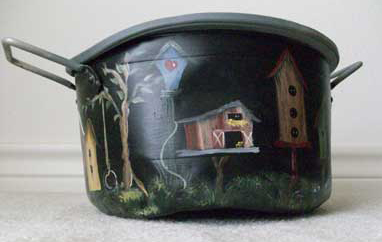 This entry was posted in Painted wood crafts and tagged birdhouses, hand painted on Friday, January 21, 2011 by Betty. When I first started painting, I could only paint something simple and easy. For me that was birdhouses. I painted them on everything I could find to paint on. 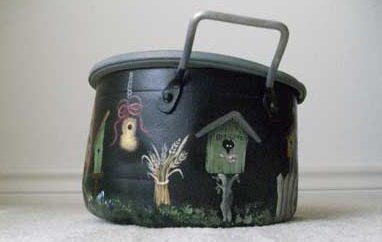 I painted them on clay pots, wooden spoons, pieces of wood, gourds, and even birdhouses on birdhouses. 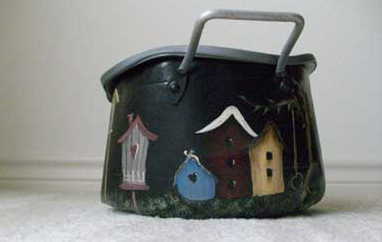 These little houses are painted on a clay pot that I use in my kitchen. I still like to paint birdhouses. We have lots of birds on our property and we feed them daily. The least we can do is build them homes and furnish them a little food. Bird watching gives us lots of pleasure. The birds will thank you for giving them a little extra food each day. I would love to know your thoughts about my blog and my painting. Til next time, keep painting! 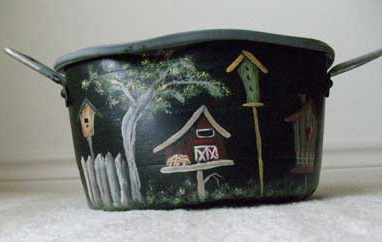 This entry was posted in Misc painted crafts and tagged birdhouses, clay pots, hand painted on Monday, January 10, 2011 by Betty.